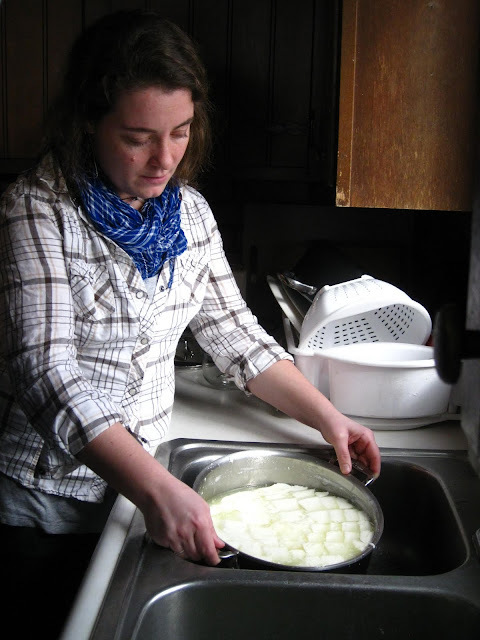 When my BFF (Best Foodie Friend) Elizabeth visited, last weekend, we went to a cheesemaking class at Wolfe's Neck Farm. And we were so surprised and excited to learn how easy making mozzarella cheese is. 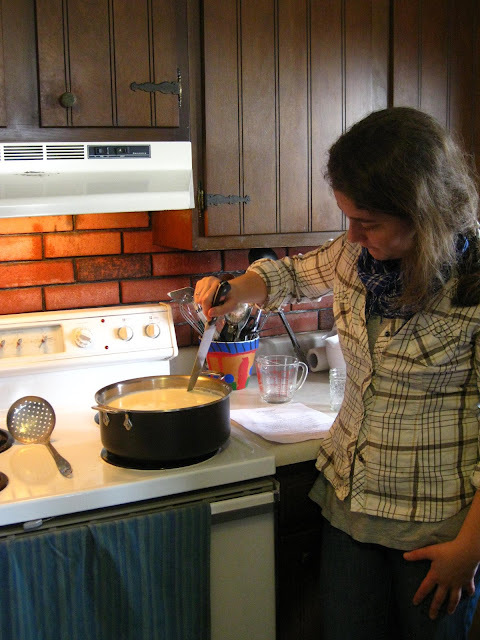 Our class was taught by Julia, who is not some crazy cheesemaking expert or anything. 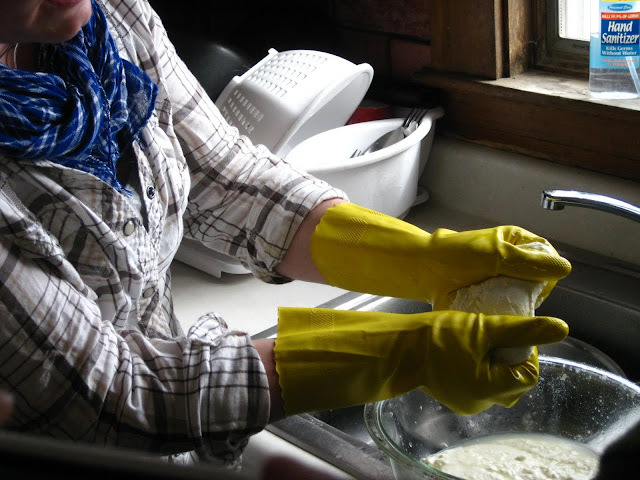 She immediately put us at ease by assuring that we could easily make mozzarella in 30 minutes and that there was always room for experimenting. To start, heat one gallon of whole milk in a stainless steel pot. Add 1 1/2 teaspoons citric acid diluted in 1 cup of cool water (I ordered mine off Amazon.com, but you can buy a whole kit from cheesemaking.com). Heat the milk slowly to 90 degrees F. Add the rennet (either 1/4 of a tablet if you're using a kit or 1/4 teaspoon diluted in 1/4 cup cool water). Stir milk gently to disperse the rennet for 30 seconds. Turn the heat off and remove the pot from the heat. Cover and let the milk stand for 5 minutes. Check the curd- you should be able to press on it and have it feel solid. Cut the curd into 1 inch square pieces. Put the pot back on the heat and heat to 105 degrees F while stirring slowly. Try your best not to break up the curd. Take the pot off the heat again and stir gently for 2-5 more minutes. 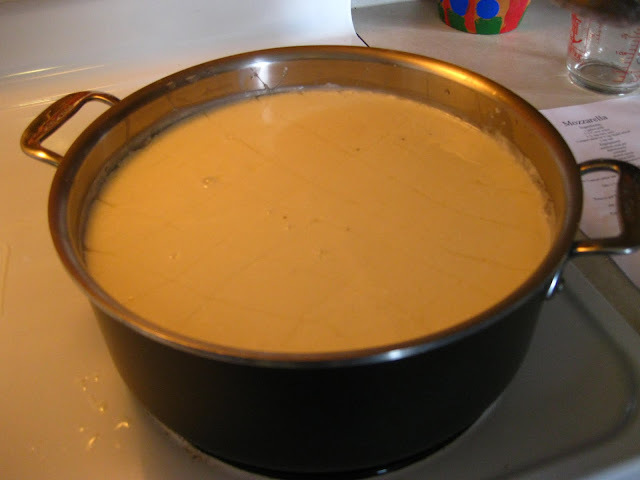 Transfer the curd to a microwave-safe bowl and begin pouring off the whey. As the curds cool, they will release more whey. Try your best not to lose the curds, but some loss will be inevitable. When you have poured off as much whey as you can, microwave the curds for one minute. 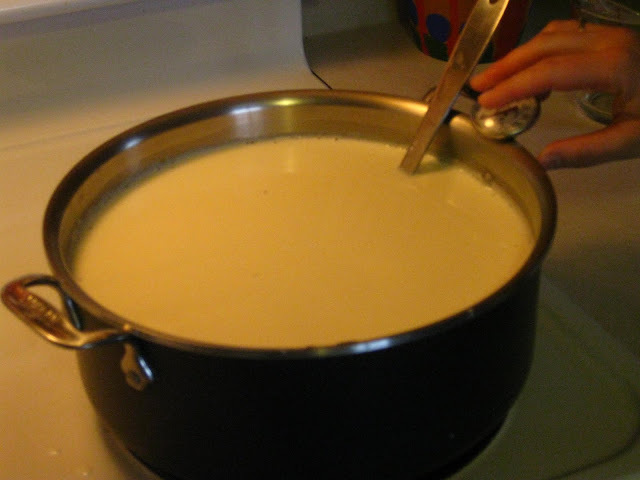 Heating will cause the curds to release more whey, which then can be poured off. Repeat a few times, until the cheese has released its whey and is becoming almost too hot to handle. This is a good time to put on gloves! 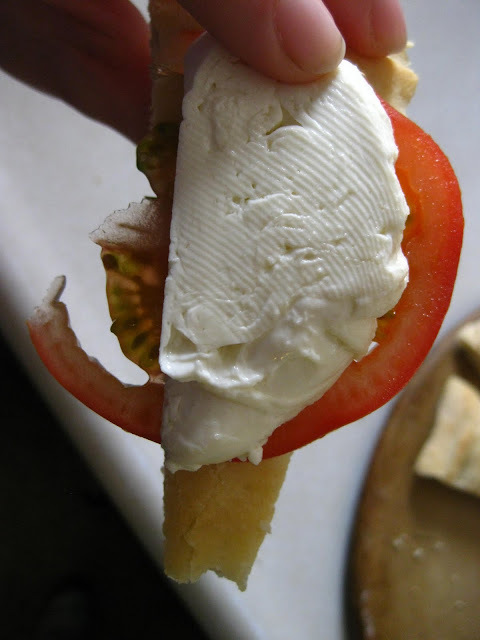 Knead the cheese by folding it in on itself until it becomes smooth, shiny and stretchy. If you feel it is too cool, you can microwave it again to heat it up. When you feel it is smooth enough, form it into a ball and place in an ice bath. This cheese won't keep as long as store-bought cheese, so it's best to use it right away (not too hard to do!). You can also add herbs, cover the cheese in oil, and store in the fridge to keep it longer. Liquid vegetable rennet is sold locally at Royal River Natural Foods in Freeport. 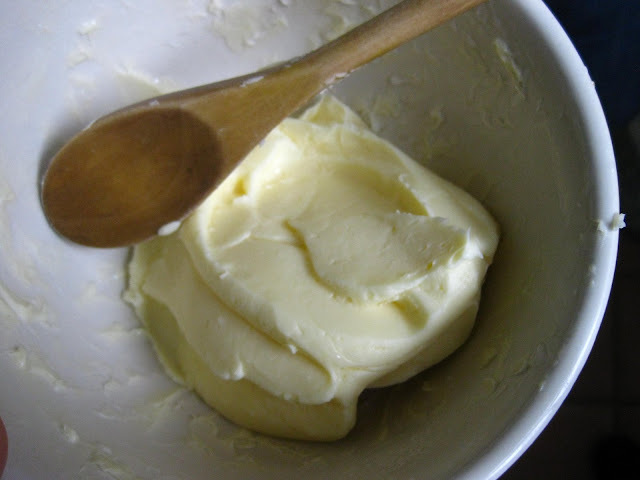 If you are feeling really ambitious in the DIY activities, you can make your own butter too! This was fun because we were working in a group, but I think I'd get awful tired shakin' that butter by myself. 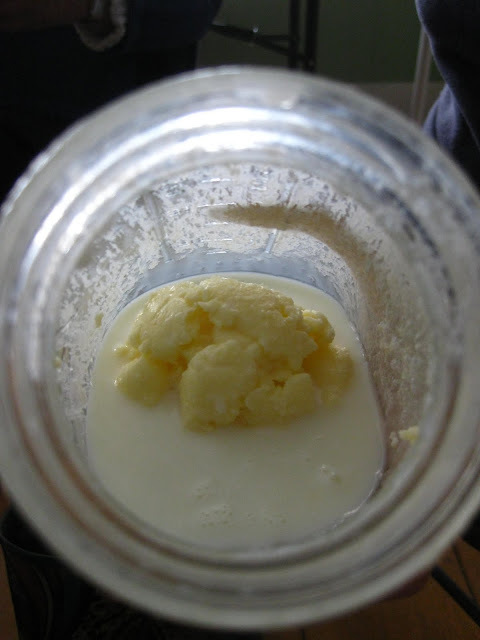 Here we just poured heavy cream into a quart-sized mason jar and shook until the... butter formed (cows came home?). The butter separates from the majority of the buttermilk, but then if you want to make your butter last longer, you need to wash it of the remaining buttermilk. 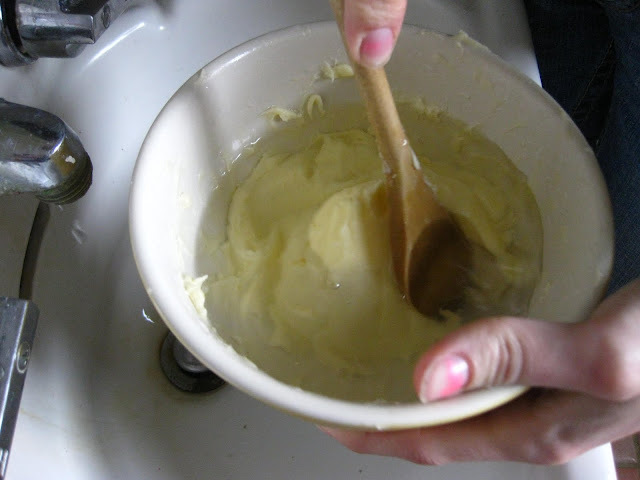 So transfer your butter to a bowl, cover it with water, and smoosh the butter around. This washes the buttermilk from the butter. Change the water and repeat until it no longer discolors the water. Are you getting tired just looking at this? 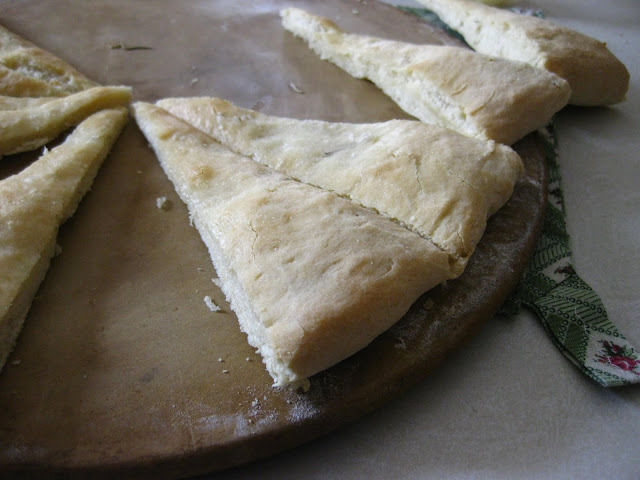 I didn't help make the foccacia, but would have needed a nap afterwards if I'd attempted all of this at home! We had a nice little snack once we baked this foccacia off (it's a little flat since it was cold in the farmhouse and didn't rise enough). Some local hothouse tomatoes completed our homemade snack. Tastes better when you make it yourself! I'm pretty excited to experiment with homemade cheese. 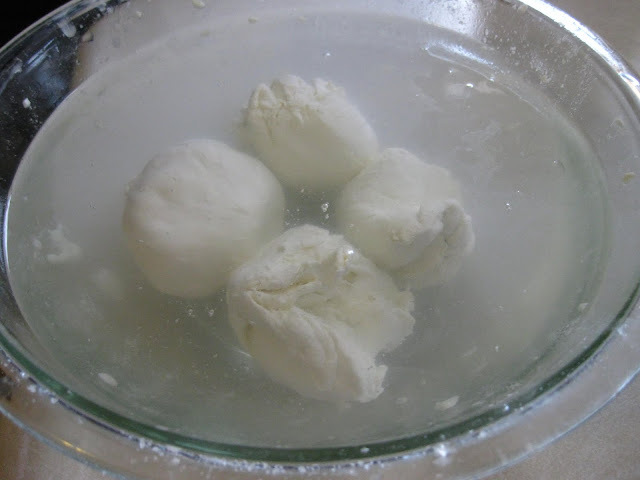 A little investment up front ($16 total for the rennet and the citric acid) and you can have homemade mozzarella for the price of a gallon of milk and a half an hour's time! By the way thanks for your latest comment, We do have many cravings but it's better to think about what you can have rather than what you "can't" ! Occasionally we do stray a bit from the "local" diet when it comes to beverages...a beer over a friends house, an espresso for an after work pick me up or a bottle of wine when all the local wines have been out of stock for awhile... but we remain steadfast in our food staying close to home ! Anyhow,its good to see someone else posting on a regular basis... We will keep checking in !